Look at what happened when I walked into our closet and decided a spontaneous organizing extravaganza was in order. Work in the master closet soon seeped out into two other closets upstairs and a toy purge in Annelise's room (she participated in the process) ending up with two bags destined for the trash and seven bags for Goodwill. I've realized that I usually wear the same things again and again yet I was holding on to a lot of clothes that I might wear (but I wasn't), clothes I didn't really like any more, clothes I had not worn in years but had been expensive and clothes I was hoping I would be able to wear again. Someday. You know, right after I break up with Ben & Jerry. I finally got over all of that and let a lot of things go, which is a wonderful feeling. Scott purged his side of the closet too so we both have more room to get to our things. As it turns out it's not really fun to struggle to hang something up or forget to wear something because you can't see it. 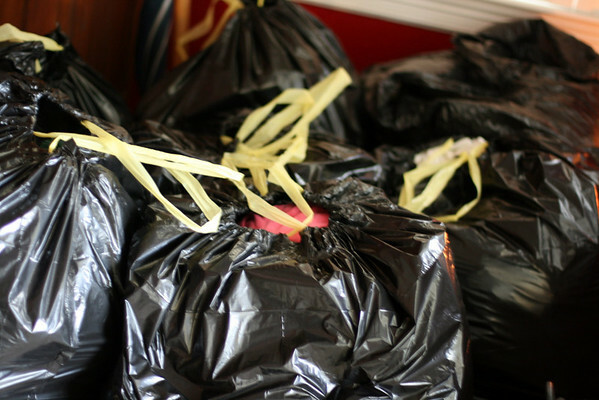 Did my recent discovery about Hoarders become my motivation, my spark, my organizing muse? Like the Magic 8 Ball says, "It is decidedly so." I need to do this yet again! Every time I clean out our closet I think I've really made progress, especially since I rarely buy anything new, and yet I'm swearing daily at the tangled hangers and stuffed area so clearly there's a problem. good for you! we have cleaned out but have not made the haul to goodwill yet. cleaning out clothes is one thing, but all the books and homeschool stuff, that was emotional for me!!! I think Hoarders is enough to make anyone clean out a closet! I did Luci and Griffin's closet cleanouts about 2 weeks ago and mine is overdue now.